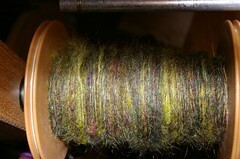 Yes, I have been spinning again! I’ve decided that with all my new crafty interests, I’d have to make time for all of them, including spinning. So my new plan is that every weekday I’ll work on a different craft and last Friday was spinning day. Maybe because it’s the last roving I bought, I don’t know. 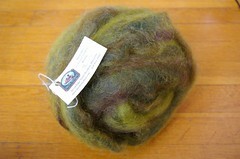 This roving is 70% Shetland, 30% Mohair from the Iron Horse Farm. This roving doesn’t have the colors in sections like other rovings I’ve worked with. Instead, it’s like the 3 main colors were blended together. You can see it a little better in this picture. As I was spinning this I realized that the ply I was getting was mostly dark green with a few yellow spots here and there. I considered Navajo-plying it but there isn’t enough color definition to make it worth while. So instead I’ll just 2-ply it. 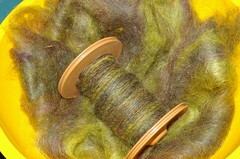 The resulting yarn will be a nice deep green, I’m looking forward to seeing this! And hopefully I’ll be able to take flashless pictures next time. You’ve been really busy lately! I’ve enjoyed seeing all of your lovely projects. ooh, pretty! Those are some gorgeous colors. yeah for spinning monday! have you thought about what you might knit up with this? hope work is going well…i’ll be watching for more spinning mondays.